I hope you are having a wonderful day. Today I am going through feedback forms. 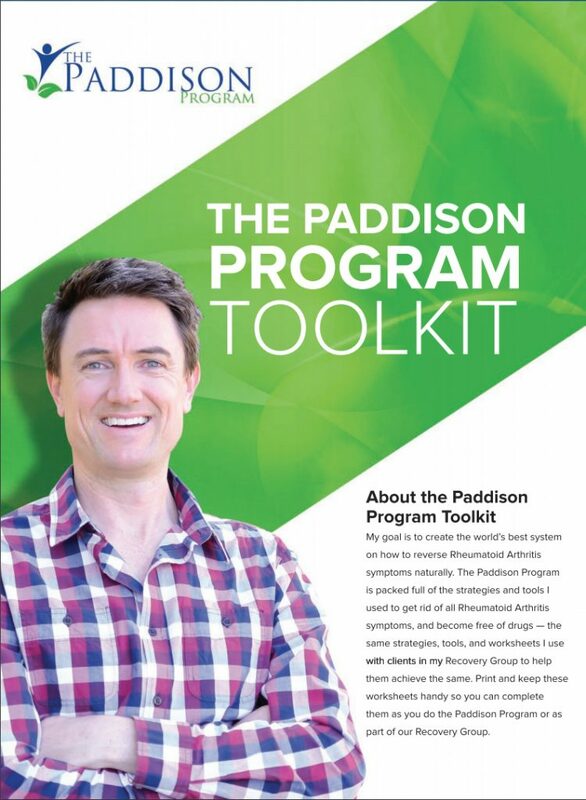 What we do is we have these questionnaires that go out three months after people start Paddison Program a questionnaire gets automatically sent out and it’s a little “May I ask you a favour?” email and ask for questions. How come we bought the programme in the first place, what would you give it out of 10? What have you been able to achieve on the program so far and are you happy if we could share the results. I go through these and I thought why don’t I share some of the results so we share one today. This is literally the last one we’ve received. And so I thought I’d just print this as an example. This is not a like the world’s greatest testimonial. This is someone who’s doing really well making progress, reduced prednisone. But there are some lessons in here that I think you’ll find really valuable. Some things that are worth discussing that otherwise I would just gloss over and read without sharing with you. So I wanted to share this with you because I think there might be some nice things to get out of. So first of all this is Dusty and Dusty so is the not one reason she joined the Paddison program, she’s been managing rheumatoid arthritis for 30 years. Okay, that’s a very long time. Western medication worked for me until last year when I got a virus and ended up in hospital. So my guess is that Dusty was taking a biologic drug. Now what happens is the biologic drug makes you susceptible to viruses and infections. It reduces the immune system in a way that makes your susceptibility much higher because what she says next is they took me off medications okay. So that’s also consistent with what happens when you’re on a biologic drug, you get some kind of severe infection and then you must come off the drug because otherwise your body cannot fight that infection because your immune system is being suppressed by the drug. And so you must come off that drug and then she says we tried a new drug which did not work and this is also very common, something I see quite a lot just because one medication works for you does not mean that the next one will. For example you might have tried something like Enbrel and found that Enbrel works well when it fails they try Humira which works on a similar principle, it doesn’t work and so you know these things are not guaranteed. It’s a little bit of a, not a little bit. A lot of trial and error when it comes to rheumatologist trying to fit a medication to a patient. This can take many many months and sometimes over a year to try and find the right medication to match with the patient and so it’s a bad thing when you get a virus, you end up in a hospital and you have to change medications. The stability of your medications is just as important as the stability of your diet, the stability of your exercise the stability of low levels of stress and the stability of any kind of supplementation that you might take. For example someone I know has just been taking small intestinal bacteria overgrowth herbal supplements and it has negatively impacted their microbiome and unbalanced the microbiome. So something was meant to be taken for a positive reason for someone who was otherwise symptom free has now developed symptoms again by taking herbal medications prescribed by a naturopath just because she had a few you know unfriendly bacteria showing up in a stool test. So you know we’ve got to be careful here. This is a delicate balance here, it’s a tightrope that we’re running and we don’t want to go mess with things and that includes the medications. So Dusty said she went back to medications that previously worked before she got the infection and they did not work as well as they used to. Again, something I see a lot and this is something that Rheumatologists are aware of. They don’t like it when you stop a medication because this tends to happen a lot when you go back onto the same medication. There’s no guarantee that it will work as well as it did before. Okay so that’s what happened here. She said the pain may be willing and I said to a friend I don’t believe this will work and I think she’s talking about our program now. She said “My friend said you don’t have to believe it will work but try and see what happens”. So I committed for a year. So Dusty’s forty three days or something like that, she 46’s days in and she said she wants to get off Prednisone and Celebrex that was that would be amazing and that’s the right strategy. So if you’re in a bunch of heavy medications, you know whether it be biologic drugs or the disease modifying range like Plaquenil, Sulfasalazine, methotrexate and so forth. This strategy that works best and I believe is correct is to get rid of what I call the discretionary drugs, the Prednisone the nonsteroidal anti- inflammatory drugs. We’ve got to get off those first while we don’t touch the heavy hard hitting stuff. We’ve got to get off the low sort of easily prescribed to you medications first because they’re the ones that actually do the most damage to the part of the body that we’re trying to heal the most which is our digestive track. And of the two, if you’re looking at Prednisone and nonsteroidal anti- inflammatory drugs I always want people to be getting off their Prednisone first. Now although the painkillers seem like the most trivial although they’re not, like oh why don’t I just get rid of them and then work my way reducing doses of Prednisone. It’s not the way forward in my view because the prednisone does far more damage than the nonsteroidal anti- inflammatory drugs. If we look at someone who was on a recent podcast guest of mine Angelica, she’d been on painkillers for something like 16 years every day taking painkillers and when she changed and went onto the Paddison program for rheumatoid arthritis she was able to come off those medications that she’s been on for a decade and a half. The same is not applicable if you’ve been on Prednisone for that amount of time. I promise you prednisone in my personal view should never be taken for rheumatoid arthritis or inflammatory arthritis for any reason at all unless it’s to get you on a plane to enable you to fly some way so that you can set up in an Air BnB and do Bikram yoga every day. That would be like the only reason I recommend it. In fact even then the flight can’t be more than 24 hours to get you anywhere around the world. So but the drug is so damaging and so detrimental that I see no reason to take it. And if you’re taking it right now and you are dependent on it, then there has to be a change of strategy. You have to massively increase your exercise, dramatically shift to a plant based Paddison program diet. You’ve got to make sure you get your microbiome supplementation correct and you’ve got to I mean if you’re dependent on prednisone you’ve also got a look at your work strategy and if you’re stressed out working hard every day you could free up some time to do all this stuff because long term Prednisone is not a good future for you you got to get off that stuff. It’s never meant to be on for a long period of time. Dusty gives the program a nine out of 10 which is great. The success that she’s had – she has decreased her Prednisone from 10mg to 6mg so that’s 4 mg of Prednisone in 46 days which is pretty good. I’ve seen a lot better. It’s not too bad. So there’s a lot of things that we can do to assist Dusty and she has recently joined Paddison program support. So I’m going to be able to work with an out and get more information from her so that we can develop a path forward to get off it altogether. She said that her sticking point is the Prednisone. Her pain is manageable and most days pain is minimal. My ankles and elbows are still swollen. I’m hoping for a better outcome in time. I think the medication is losing efficiency due to chronic swelling and flares. Diet has definitely helped with the pain and yes you can absolutely share this. I hope I have a great story one day and that I’ll be off all my medications or at least Prednisone and Celebrex. I’m glad that my message has been well heard by Dusty with regards to the hierarchy of the medication. So what you want to do with Dusty when we start really getting into the nitty gritty is just focusing on the other key areas that she can utilize to really suppress this Prednisone and and later the painkiller usage because the Prednisone is two steps forward one step back. It causes more leaky gut, it causes osteoporosis and what I consider most detrimental is that it depletes the mucosal lining and the mucosal lining is where the bacteria live. In your colon you have two layers of mucus a little thin layer of mucus that sits right on the epithelium. Right over the top junction cells. And then there’s a thicker, bigger layer a second layer that sits right on top of that and that’s where all your bacteria live. And if you’re depleting that you have no home for this bacteria. This is why it’s so hard to help folks who’ve been on Prednisone for so long because it takes a long time to restore that mucosal line. And there’s a lot of work to be done in being able to achieve that. Some of the foods that are useful for doing that are difficult to tolerate in the early stages because the body is just so exposed to that allergens from all things or foods that it just takes longer to be able to get to those foods that are helpful. Okay so anyway the process what we want to do if you’re stuck on Prednisone and painkillers that approach you need to look at your disease modifying drugs, look at your biologic drugs and say Well is there room to move up on one of those if you’re only taking 10 mg of methotrexate but you’re on Prednisone. You definitely want to be increasing the methotrexate to get you off the Prednisone. In my view that’s a real no brainer. Okay but then are there other much less 100 percent upside options. For example can you buy a stationary bike and first thing in the morning when you get up can you get on a stationary bike and build the sweat before you go to work. It might only take 25 minutes to build a sweat in your day at work will be entirely different than what it would have been otherwise. When you come home before going to bed can you exercise again, it will really help you fall asleep, give you a lovely sleep and really help to alkalise the body and maybe help you to more quickly reduce that Prednisone. And once you’re off the Prednisone and eventually your painkillers, finally you have a fair battle to then try and heal the gut because until then it’s a battle. So Dusty and I’ve got some work to do. I’m going to be helping her making sure that I can definitely make her achieve progress forward and I hope that this little case study here has been helpful. And if you’re watching this on YouTube, give us a thumbs up and subscribe because then you’ll get straight to your inbox these new videos that I create when I create them and you can click through and watch them straight away. Thanks so much and happy healing! What you need to do is that while staying away from too much of animal protein and focus more on vegetarian cuisine, with very light medication you need to do Meditation. Meditation powers your mind to be balanced and that enables blood to have more strength and higher immunity power. That helps you to fight RA and slowly you can come out of it all. So the solution is Meditation more and more and little medication.